The LAPT is a resource and rating system we created to certify that green roofs and walls are designed to achieve measurable and replicable performance benefits. Below are some innovative and forward thinking projects that are going through LAPT certification. We are planning a full grow roof that is approximately 7,100 sqft in size, a 1,250 sqft greenhouse on the roof, and a two, 2-story living walls that are approximately 600 sqft each. This project was needed because of student growth. However, as we designing the space, we wanted to ensure it limited our carbon footprint and also served as an educational tool for students and the community at large. The end result was a net-zero building we believe will achieve LEED Platinum level certification and Energy Petal certification from the International Living Future Institute. The green roof, living/green walls, solar arrays, and glass paneling are all ways to show how buildings can be designed just a little different to provide sustainable practices. The rooftop meadow is designed to be self-regenerating throughout the years. An ultra-light media blend mimics the physical, chemical, and biological aspects of soil, allowing for a diverse plant palette capable of growing a huge variety of wildflowers and native species. The plant design takes inspiration from the adjacent Charles River ecosystem; milkweed, aster, rudbeckia, and other native perennials blend into a seeded mix of quickly germinating cover crops including flowering buckwheat, daikon radish, and clover. The meadow seed mix unifies the seven roofs while distinct clusters of herbaceous and woody perennials create a distinctive patterning. Honeybee hives on the roof are monitored for data on bee foraging preferences. A creative irrigation plan secured the seeded media during establishment and efficiently transferred water to plants, uninterrupted between all levels on the multi-tiered roof. Diamond Schmitt Architects’ redesign of the historic Holy Blossom Temple in Toronto includes a light-filled atrium that connects the existing Sanctuary and school building. This new central space and community heart prominently features a three-story, 610-square-foot Living Wall Biofilter. The Living Wall incorporates over 600 plants and more than 20 species. Certain species were chosen for their significance in Jewish traditions: wheat, barley, grapes, figs, olives, and dates are represented. Congregants will nurture 150 plants at home prior to their being installed in this attractive feature that actively filters indoor air, enhancing the fresh air provided. The Carroll Rooftop Farm is a space for food, fellowship, education and employment. It’s a model for the future of Chicago’s urban agriculture, one where green roofs are spaces for multifaceted community engagement and ecologically-responsible food production. The site features four roofs, three of which are farmed commercially, and one 1,200-square-foot rooftop lawn used for observation and research. The roof produces 44 crops in more than 100 varieties including apples, potatoes, radishes, turnips and raspberries. Every week during harvest season, produce from the roof is picked and packaged onsite before it’s sold to nearby restaurants and consumers. The City of Calgary retrofit two of the many roofs of the thirty-three year old Municipal Hall Complex. 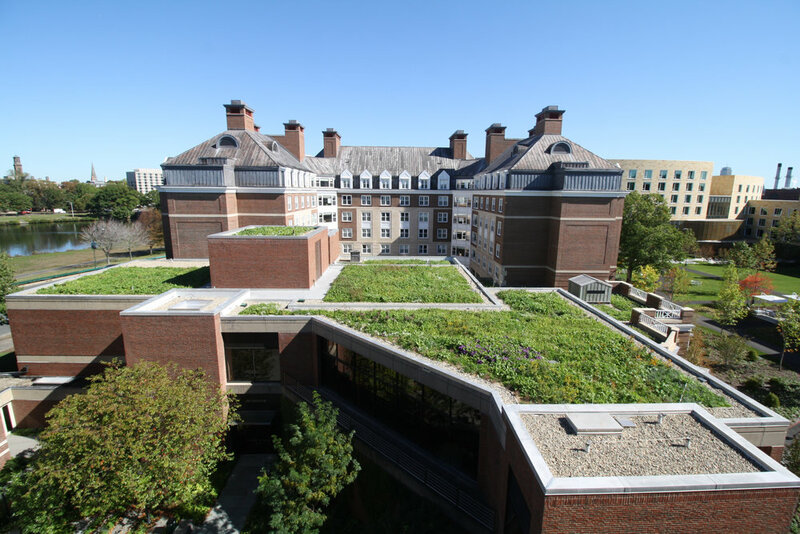 This created an opportunity to develop a green roof research and demonstration project. Research infrastructure was implemented to monitor stormwater run off and water quality as well as examine the heat flux of the assembly as compared to a conventional reference roof. A study was made to evaluate a palette of viable plant species and document the associated maintenance requirements of the green roof. The project serves to build awareness and educate about the benefits associated with the technology and contribute to the development of supportive policies for green roof implementation. The Memorial Stadium Green Roofs are two large, steeply sloped green roofs atop the 1926 World War I Memorial Stadium at Kansas State University. The roofs encompass approximately 43,000 square feet total representing the largest green roof assembly in the State of Kansas and were installed with an aim to protect the structural integrity of the rooftops by limiting the number of visitors on the stadium seating. The design intent was to bring the ecological diversity and resilience of the surrounding Konza Prairie into the heart of the campus with a focus on public environmental education and research. This is an urban, zero lot line project that has implemented green roofs on three of the four roof levels. These roofs assist with controlling stormwater while simultaneously providing views of nature for staff and patients. The green roofs are planted with a wide variety of native and adapted species and are irrigated with rainwater that is collected onsite in a cistern.